Keep your dog healthy and fit with this easy peasy homemade recipe – it’s cheaper than store-bought and chockfull of fresh veggies! Heat olive oil in a large stockpot or Dutch oven over medium heat. Add ground turkey and cook until browned, about 3-5 minutes, making sure to crumble the turkey as it cooks. 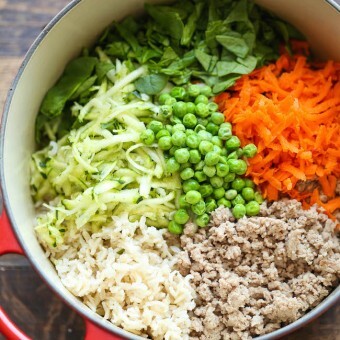 Stir in spinach, carrots, zucchini, peas and brown rice until the spinach has wilted and the mixture is heated through, about 3-5 minutes.